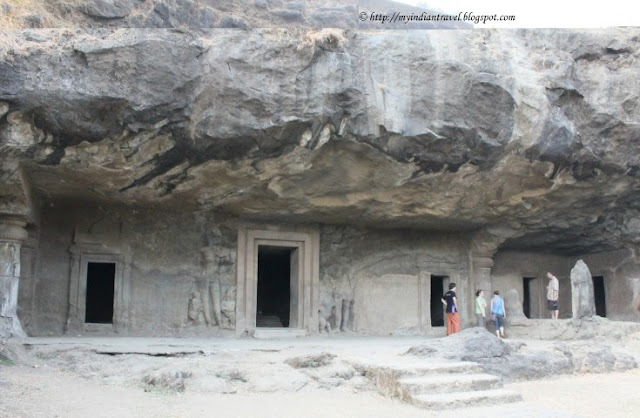 Elephanta is famous for the magnificent Great Cave. But there are also other caves here that are not in great shape. One among them is Cave No. 4 built anytime between 6th and 7th century A.D. It has a portico in front of the cave with several entrances. On either side of central entrance there was probably a chapel or room with pillars in front. The central entrance on the portico leads to a damaged shrine. The shrine door has door-keepers at each side, leaning on dwarfs, with door-keepers and demons on the jamb and architrave. The shrine is a plain room 6 m deep by 6 m wide with a low altar, holding a Shiva Linga. Really interesting place, nice of you to share! Wonderful perspective on the cave! I like the first photograph BEST because there are people in the image. The second photo does peak an interest wondering what is behind the doorway. Interesting photos this week. Thanks for posting. Fascinating. Never knew about this. Wow, it looks like an amazing area! Things like this are so amazing to me. What a unique looking cave. What is in the cave ? You can see the massive size of the caves in that first photo. I am a bit claustrophobic, so I don't think I'd venture inside. Is it safe to enter or dangerous if the stone is crumbling? The door to the past. I always learn about something new here. What an intriguing place to visit. That's a really interesting cave. I have never ever been to any caves. Someday I'd like to see one in person. Nice post. Very majestic, even if not in the best shape!